Do you have a Costco membership? If not…WHY!? At this point, the only two good excuses for not being a Costco member are living too far away from one OR living alone and therefore not deriving enough benefit from a having a membership. 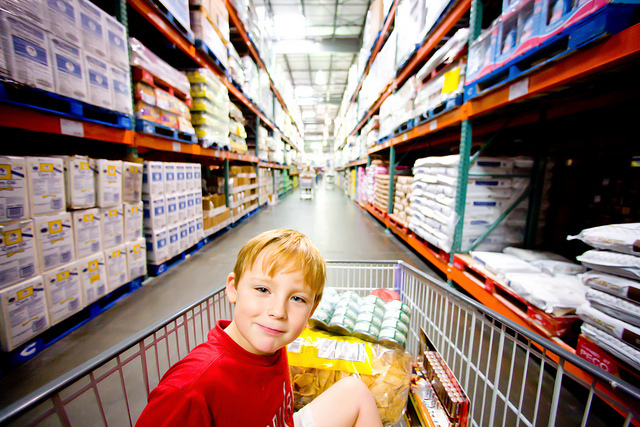 So, if you aren’t a member of the best warehouse club on earth, here’s a list of items that will single-handedly pay for your Costco membership – hopefully this will entice you to check it out. Each one of these items will, by itself, pay for the $55 a year membership fee. And even if you are a member, here’s some items to take advantage of on your next visit to the value-laden warehouse giant. Tires – Where’s the last place you got new tires? If it wasn’t a warehouse club you probably paid too much. The service and price offered at Costco for tire purchases are unparalleled. The only other legitimate consideration would be an online purchase through TireRack. The great thing about buying through Costco are the free tire balancing and rotation (plus free flat repairs) that you’ll get. That’s not normally something we factor in when making a tire purchase, but it keeps those rubber fellas alive for a lot longer which saves you money. Pay attention because Costco often offers $70-80 off certain brand of tires at different times of year. Just one set of tires will more than pay your Costco membership fee. Lunch – Do you like to eat out? Well Costco is a fantastic place for a date. My friend Wiley takes his wife Jenny there pretty often and it’s incredibly romantic. First, they take a stroll around and collect some free samples. Then, they head over to the lunch counter for a hot dog and some frozen yogurt. You’ll spend just over $2 and you’ll actually get filled up (those hot dogs are ¼ lb!). 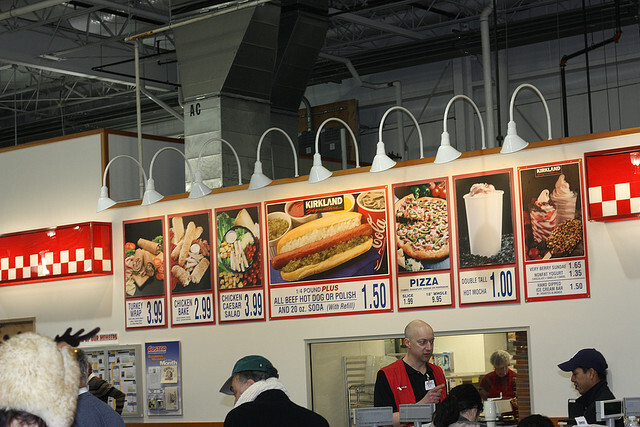 Costco’s lunch lineup isn’t super diverse, but it is tasty AND filling. If you save a few bucks on lunch just twice a month it will pay for your membership. Movie Tickets – I don’t often go to the theater for a movie. It’s just too dang expensive. We’ve all got our favorite ways to blow a few dollars though and if going out to the movies is one of yours it’ll more than pay for your glorious Costco membership. The regular price for a movie where I live can be anywhere from $11 to $13. Costco will sell you two tickets for $17 (sometimes even cheaper). So if seeing the newest flick on the big screen is important to you, Costco’s discount on movie tickets will be well worth the cost of membership. By the way, Godzilla looks amazing! 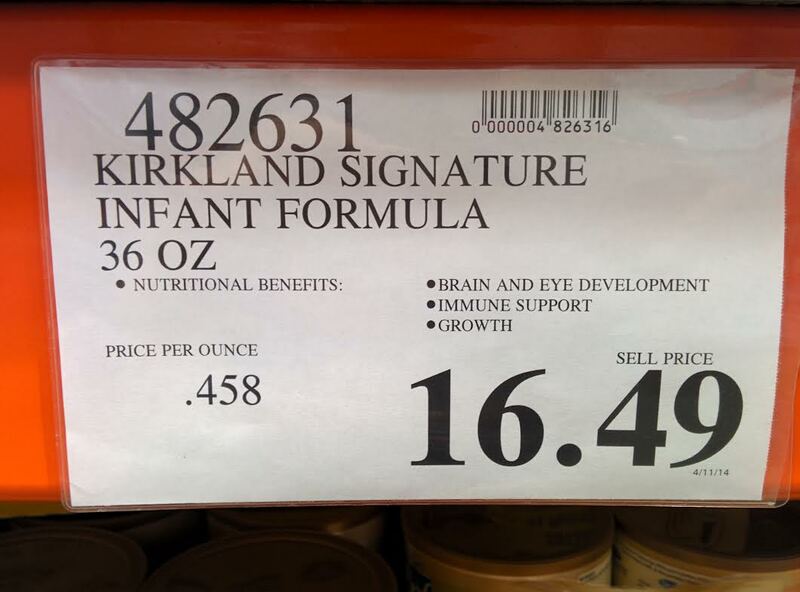 Kirkland Signature Baby Formula – If you have kids and don’t have a Costco membership I just feel sorry for you. You could be saving a lot more money. Baby formula is probably the sickest value proposition Costco offers. It is seriously less than half the price of formula you might purchase at your local grocery store. As you can tell from the picture above, even with the discount at Costco, you’ll still pay double for name brand formula. Kirkland signature brand formula is 46 cents an ounce and the name brand, Enfamil, is 89 cents and ounce. You’ll pay for your membership quickly with purchase of just this singular item. My wife and I are using cloth diapers, but if you are going the disposable diaper route, Costco offers the best value in that arena too. Luggage – I just purchased a new set of luggage, and the value that Costco provided was incredible. The actual cost of the luggage is super competitive, but on top of that, Costco offers the best guarantee in the land. I wouldn’t buy luggage anywhere else. My final cost was $100 for two fantastic pieces of luggage and I’ll never have to come out of pocket for new ones again. That’s unreal. Guarantees – Speaking of the luggage guarantee. Costco’s overall guarantee system is a great reason to shop there, and will single-handedly pay for that Costco membership. In fact, if you’re ever dissatisfied, at any point, you can get a free refund for the full cost of the membership itself. That means that if you test out my Costco membership theory and find it lacking, it won’t cost you a dime. You can read more about the epic Costco guarantee system – it won’t let you down. Wine – If you’ve been reading this blog for any amount of time you’ll know that I’m not a wine guy. Craft beer is my thing. But if you are a wine connoisseur, Costco is the place for you. That sounds odd, but from everything I’ve read about Costco wine, the stuff is supposedly really good. And your average savings will be around $5 a bottle. There’s a great blog detailing all the great Costco wines. The author even has a “value section.” That’s where I would be looking…if I drank wine of course. 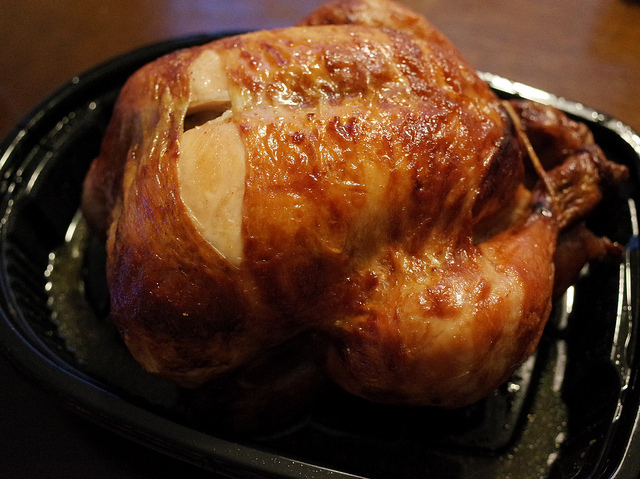 Rotisserie Chickens & Pizza – I’m had to add these items to my list. Mostly because I love them and they make dinner really easy sometimes. I’m pretty sure Costco loses money on the rotisserie chickens too, cause $5 is just insane. Fair warning, if you get addicted to their delicious and gargantuan pepperoni pizza, it wasn’t my fault. Gas – I personally don’t use this one much. The line to fill up at the Costco gas station just wastes too much time. But if you get lucky and the line is lacking, make sure to fill up. In some areas of the country you can save almost 30 cents a gallon just by filling up at Costco instead of your local gas station. That means that one or two tanks of gas a month could single-handedly pay for that $55 Costco membership. I’m a big fan of Costco. And if any of these 9 items are something you buy regularly elsewhere, you should definitely start considering a Costco membership. Because just buying one or two of these things at Costco instead of the retailer you are currently using will save you big money – and you’ll find big value throughout the store in other areas. Costco membership is amazing and there’s no going back once you’ve crossed that glorious money-saving threshold. All great deals! Just to make it clear (since I also made this mistake), if you have the Executive Membership that pays you back 2% on every purchase, gasoline is NOT included in that, among many other things. Still, as Joel noted, in my area the price difference between Costco and all other stations is around $0.30/gallon, and with my driving habit that saves me $200 a year! I’ll throw in one more big one, prescription and over-the-counter drugs! Even with just the most common OTC drugs can net you at least $50 a year. Also, MILK! In my area, Kirkland Signature brand milk is $1.20/gallon cheaper than Kroger, Walmart and Meijer store-brand milks. Buy just a gallon a week nets you $62.40 in savings! Costco’s cash price on prescription drugs is sometimes cheaper than what my insurance will pay. Another perk is you don’t have to be a Costco member to get your prescriptions there. Yep! Costco prescriptions are the best deal out there. I wouldn’t go anywhere else. Yep. I almost included dairy on this list too. Their eggs are a tad cheaper than Aldi, but WAY more tasty. That’s awesome that Costco gas is saving you that much man! Thanks for the shout out buddy! We love that place! Besides our hotdog purchases, we have recently purchased a king size mattress as well as several pieces of furniture. The return policy is amazing and makes dropping the $$$ for a piece of furniture a lot easier. We also love the Executive Membership, it is an extra $55 but comes with a 2% annual cash reward that can easily pay for the added cost. If for some reason you don’t make back the extra $55, they cut you a check to make up the difference! You are the Costco master sir. I had to include you! Their return policy really is second to none. That’s one of my favorite things about the glory that is Costco membership. 5 bucks for a chicken? That is a great price! I have lunch there several times, but it has been a while. If we have a kid, then maybe we will get a membership again as baby formula seems like a steal at Costco. Yep. That baby formula will save you TONS of money man. Not to mention that the chickens are bigger at Costco than at the regular grocery stores. True. Our fam can eat on a chicken for multiple meals. And then there’s some left over to make baby food. More on that to come soon. I’m not sure how gallon jugs of mayonnaise didn’t make this list…. Otherwise, this sounds like it’s working out real well for you — particularly with that baby formula. It would have made the cut if mayo wasn’t nasty, hah! We DID, however, buy the biggest bag of baking soda you’ve ever seen. Well worth it cause it keeps those diapers nice and white. We got a membership as a one year expiriment, then did the math. And even though it’s just the two of us, we made our money back in 3 months just on paper towels, kitty litter alone! (We only have 2 cats, promise 😉 And then there’s the Aidells’ chicken Meatballs, which are a steal there. Totally addicted to those. (I throw them in baked ziti, or serve them with brown rice and a veg for a quick meal on a work night. Heck, I’ll pop a few in the microwave for breakfast before work. Always a treat.) Verdict, Costco is a keeper. Going to have check on those tires, thanks for the tip. Ooooh. I’ll have to try those meatballs. I’ve tried their chicken sausage and it was MOST excellent. It’s amazing how even with only two people, and a cat 😉 you can still easily save money at Costco. Thanks, Joel! I also found a Costco membership saves big bucks on car rentals. In fact, their prices were unbeatable on a recent rental I just enjoyed taking to Atlanta. Great tip Clara. Thanks! I haven’t checked out their car rental rates! And lets get a beer next time you’re in town! Had to rent a car to drive from Salt Lake City, UT to Idaho Falls to visit friends. The price quoted & available through Costco saved my wife and me over $100 on a weekly rental. Even with AARP membership, etc. we could NOT find a better deal anywhere and I personally called the major rental companies. Awesome arrangement …. and, when we arrived in Salt Lake they were out of medium sized vehicles so I tactfully reminded them I had a reservation through Costco and the upgraded us to a luxury sedan at NO extra cost … better than awesome! Thanks for the tips. I’ll be checking out the gas and movie ticket deals. You’re welcome! Thanks for dropping by! Glasses. I had gone to a regular ophthalmologist and got my prescription. when I priced out glasses and frames there, it came to just shy of $500. I went to costco and got frames and lenses with all the goodies (transitions, progressive bifocals) for just under $100. That’s awesome! You know, the only reason I didn’t put prescription glasses on my list is because of super cheap sites like Zenni Optical . Check that out and let me know if that could save you even MORE money! The savings on glasses are staggering, especially so if you need graduated bifocal or trifocal and want to add the sunlight graying feature, and also take advantage of a second pair, such as prescription sunglasses. Kind, expert service and adjustments for perfect fit, as well as cleaning, are free anytime. I saved way over half price and would NEVER go back to a glasses chain or optician ever again. On the cheeselover side, the feta and blue cheese containers for your salads are unbeatable, too. I got my glasses frames at Shopko b/c Costco didn’t have quite what I was looking for, but the lenses at Costco (graduated trifocal) were over $100 cheaper so I didn’t mind the $18 charge to work on frames that weren’t from their eyecare dept. We don’t have a Costco but we do have Sam’s. We paid for our membership with wedding tablecloths. They were dirt cheap at Costco and we got to keep them when we were done! It’s insane it cost more to rent them then it does to buy them. VERY cool Lance. Renting stuff for wedding can be SUPER expensive. Way to save outside the box! Also prescription eyeglasses and checkups. My whole family wears glasses, and we have no eye care insurance, and again, you don’t have to have a membership to get this great deal. Great call Beejay. Vision insurance (for most people) is a waste of money. With places like Costco offering $60 vision exams and cheap prescription glasses it might be time for a lot of others to assess whether they need it or not too. It wasn’t very expensive under our insurance plan and we still kicked it to the curb. Would like to point out that what most people think is vision care insurance is a scam, implemented by Luxotica. We have the executive membership, got tires last year and got a check back for $82. All I had to add was the difference to renew this year. Can’t beat CostCo for my Meds either. I have no insurance and they are the cheapest and service is great! Costco for the win on meds! Janet, do you have their AmEx credit card as well? No annual fee and 2% cash back on all Costco purchases – plus other perks. Sounds like it would work well for you. And I’m sorry, it’s just 1% at Costco. Still better than nothing if you shop there a lot! I’ve always maintained that an extended family (aunts, uncles, brothers, sisters and their children) shopping TOGETHER at Costco could save the entire family money. And it only takes one person to have a membership. Here’s what I mean, if everyone agrees to pay into and help share out things like that HUGE brick of American cheese, spices, coffee, rice, flour, potatoes, toilet paper, paper towels, laundry and kitchen soaps, some fresh produce, etc., well they could save from 30-70%. Even grass-fed butter is relatively inexpensive. Grocery store charges $4.99-6.99 for a half-pound brick of KerryGold. Costco packages 3 one-half bricks together and charges only $7.49 (my price). Like ALL stores you have to know the local rate at the typical grocer to know where you’re getting a deal, but it’s well worth the work. Good point Namma. I’m all for pooling resources! By the way, the best prices I’ve seen on Kerrygold (which is awesome) are at Aldi. If you have one near you you’ll actually save even more buying in smaller quantities on that one item. Aldi has a lot of other cheap awesome stuff as well. One thing that was not mentioned about tires is that Costco has a 5 year replacement warranty. This is an amazing deal for those of us who live in the pot-hole state (aka Michigan). We will never get tires from anywhere else. You just taught me something Lisa. Thank you! How about coffee, half and half, canned tomatoes, the BEST maranara (no sugar), batteries and jeans? Yes, yes, and yes! Especially the Kirkland Signature coffee roasted by Starbucks! Killer deal. Definitely buying my luggage at Costco though – I never even thought of that! Thanks! You’re welcome Melissa. Let me know where you come down on those movie tickets! Like I said, it’s something we rarely use but I figure a lot of movie buffs would love the idea. Another item that is much cheaper at Costco (or Sam’s Club for that matter) is the package of furnace filters. They are the 3M allergen blocking type; three in a package. That definitely pays back your membership. DVDs, particularly if you buy seasons of different TV shows, can be much, much cheaper at Costco (or again Sam’s Club). Their prices are sometimes even cheaper than Amazon. Good to know. Thanks for the tips Sherry! Definitely a fan of the eyeglasses. I have a 7 year-old who got glasses a little over a year ago. The first pair we got at Lenscrafters for $295. When one of the nose pieces broke after 13 months (just outside the 1 year warranty), I decided to check out Costco. They just happened to have a buy one, get $30 off a second pair deal. I got two pairs of glasses – essentially the same polycarbonate, anti-reflective, scratch resistant lenses we had in the other pair – for just over $150. Both pairs have a molded nose piece so they won’t break again. They’re Hello Kitty, came in a special case, and my daughter loves them! I won’t go anywhere else. I’d also recommend the tires and 2-packs of cereal (great deal) as a top grocery item. Just picked up a 2 pack of Cheerios Shane. Since it was on sale I’m pretty sure it was $3.50 for like 3 months worth! And killer deal on those eyeglasses. I love when they have sales. Makes the prices irresistible. The Kitty Litter is great! Fresh Step Clumping…42 lbs for about $13!! And kitty condos for about $65-70 that would normally be well over $100…about six feet tall. I don’t have a cat, but their dog food is excellent AND the price is wonderful. Good to know that pet items are overall a great deal at Costco! Now, if only they could make a Costco for singles or couples. A gallon of mayo is such a deal but it would go bad before i finished even half. And would seem to be difficult to establish a group buying club to divy up the “warehouse” size quantities. Still trying to figure out what to do with all those AAA batteries. Jim, if you can figure that out you’ll be a rich man! Consumables like: toothpaste, toilet paper, toothbrush heads, razor blades, etc. can make a membership worth it for a single person. For me, the 8-pack cases of Amy’s organic soups are an added perk! Lunch for nearly two weeks, for $12. Can’t beat that! Costco gas is open an hour past closing, I go usually about 30 minutes or so after and I never have to wait. Great tip Phonz! Thanks for stopping by. You can get an INCREDIBLE deal on Breathe Right strips. I was paying around $8 for a pack of 10 in my local retail store. Costco has a pack for 40 for around $11!!!! A pack of 40 not for 40! You don’t need a membership to purchase the food or the wine. Whether or not you can purchase alcohol without a membership entirely depends on state law. Food you most definitely need a membership. Maybe he means the food from the food court? No membership needed to enjoy those polish dogs! (Gillete Mach), Kirkland Allergy tabs (EXACTLY the same as Xyrtec, but those are 40 cents a tablet, Costco’s are 4 cents a tablet), and Airborne…cheaper by far than anywhere else! Those allergy tabs are SUPER cheap Carla! Good call! Pharmacy–it is lower priced for meds. and OTCs than most other places. You can save money by doing price checks (ours near San Francisco will do it either on the phone or in person) and compare before having your Dr. make out the Rx (prescription). We save even more money more times than not by having the Dr. write a year’s quantity of maintenance drugs to be dispensed at once, vs. 12, 30-day prescriptions and store them in a Tupperware-like container in the frig. and take them out to come to room temperature, as needed. Costco’s cash pricing w/o insurance submission is usually lower than the yearly co-pay for 12, 30-day Rxs or 4, 90-day Rxs. One Rx has a $40 (4 x $10) co-pay yet we get a year’s supply for only $12. The Costco main pharmacist turned our family and extended family onto this saver! Movie tickets–you can now purchase immediately online as e-tickets sent to our computer and print for the same price ($15.99/2 tixs.) as in the warehouses. Electronics and accessories, TVS, etc. Usually 1 year addl. free manufacturers warranty and several more if SquareTrade purchased if you want an extended warranty coverage plus free extended years. Travel and Entertainment–We’ve travelled to other countries (Cancun.MX) and states/attractions (Disneyland) with lodging, flights, and trip cancellation insurance via Costco Travel services. Lowest prices for lodging, trip insurance, flights, etc. with so many free perks or addl. reduced priced resorts/hotels packages, even for Executive Members, and sometimes even pre-paid Costco Gift Card (our was $150). In MX, we rcd. addl. ground transportation, hotel guest travel packages and daily perks at the hotel resort than other guests, at no addl. cost! Checks printing and other services–very low prices, even more discounts for Exec Members. Bakery–save on regular and special occasion cakes (1/2 sheet cake about $16), fancy cakes and pies, breads, muffins, etc. American Express and Exec. Membership–collect twice on total purchases with two rebates each year! That’s all the comes to mind for now. That’s a LOT of savings. A 30 year member? Way to go! Thanks for all those great tips. Costco really is a great place. Flu shots are cheaper too! $14.95. That’s at least $10 cheaper than anywhere else that I’ve heard of! Passport photos are only $5 at my Costco, much cheaper than $10 at Walmart and $15 at the post office. Thanks for the share Annie! Great to know! That must be a regional thing, as our Costco has a ton of organics. Try asking a manager. I became a Costco member for their vacation packages and car rentals! Just one vacation to Hawaii paid for the membership several times over! Sweet. For my next vaca I’m going Costco! We have used the auto buying program twice now. Last year we saved 4 grand off the price of the car. I agree with all the comments above. Great company! Car insurance available at Costco through Ameriprise/American Express! We insured 3 vehicles through Nationwide … shopped around and found a $400 cheaper rate at Geico. THEN I checked out the Costco/ Ameriprise. Seriously… the annual rate for the same vehicles with the same coverage was a savings of over $800!! Your car insurance needs and history may be different from my own but it will cost you nothing to check it out except a few minutes on the phone. My wife has worked at Costco for over 20 years and it seems like we’ve tried about everything but it still surprises us. The have the best selection of quality frozen foods. Things that taste good and saves you time. One great area where you save 30-50% and more, is in the gourmet cheese section. Take some time to compare to any other store and you’ll be amazed. Love the Dubliner and the Parmesano Regelano at huge savings. Very good cell phone plans too. Costco photo hasn’t been mentioned yet. 4X6 prints are $.13 compared with Walgreens at $.29. 8X8, 8X10 and 8X12’s at Costco are all $1.49 each. 11×14 and 12×18 are $2.99. Walgreens cost 8X10 is $3.99 and their 12×18 is $12.99!!! Costco’s Kirkland brand of Toilet Paper is worth the price of admission alone. Larger rolls last longer and therefore need to be changed less frequently. Don’t forget cell phones! And if you visit Hawaii, get you car rental from Costco, buy you gas there on most of the islands and have the cheapest lunch in Hawaii, and Costco is the BEST place to buy chocolate Mac nuts and Kona coffee to take home. When I was married, I was a Costco shopper. But as a single person who eats almost no processed foods, I didn’t think Costco would make sense for me. But the day I joined some friends shopping, Costco was offering rewards to get the Executive membership and Amex, so I left there with $45 cash (almost half of the membership paid for!) First rain of winter: saved $20 on windshield wipers. More deals for me were the TP, wild caught salmon, prescriptions, coffee, cheese, almonds, gas, clothing basics. Here’s a fun one I haven’t seen mentioned yet: Sharebuilder $50 cash bonus to open acct AND $2 stock trades. That’s an unbeatable trade price. I’m definitely going to see if their auto insurance can beat my carrier. I’ve been a member for about six weeks, and I’ve saved about double the cost of the membership. Vet prescriptions! Huge savings. My vet told me he could fax to Costco pharmacy and save me big bucks. Your article said tire mounting and balance are free which isn’t true in Virginia. It is 15$ per wheel, which isn’t bad, because it does give you flat repair and balance and rotation, but not free. Their bras – 2 in a package – are the best! Cheaper than anywhere! And their bikini underwear 5 in a package – so comfy and an incredible deal! Can’t beat the giant bin of organic greens for 3.99! When are you going to build a Costco in or very close to Sidney, Ohio? We are located right off Interstate 75 between Lima,Ohio and Dayton,Ohio. The nearest Costco is approximately 2 hours away one way. All we have is Sam’s Club which is 40 minutes away but would much prefer a Costco.. Oh we do have a Super Walmart Store so that should explain a lot… Food prices around here are very high. There is only my husband and I now but I still spend a lot on groceries. Other people can’t afford a lot so I do what I can. Please consider building in our area. Thank you. Walmart needs some competition. You would do the job. Good replies in return of this issue with firm arguments and describing all about that.